SQUIRE Old English padlocks have forged steel shackles, steel cases, 4 lever lock mechanism and keyhole covers. 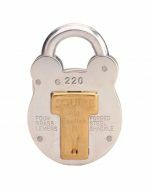 They are excellent for use in outdoor conditions where other padlocks would seize and jam. Available in 3 sizes and are available keyed alike.